Marc van der Poel (éd. 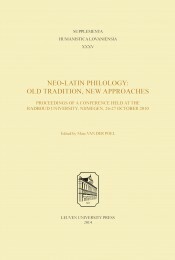 ), Neo-Latin Philology: Old Tradition, New Approaches, Leuven, 2014. Neo-Latin Philology: Old Tradition, New Approaches explores the question whether the approaches developed in the so-called New or Material Philology can be applied to the study of Renaissance Latin literature. Two contributions in this volume focus on theoretical issues, the first presenting a critical assessment of the debate on New Philology in the 1990s, the second providing some guidelines for researchers of the materiality of sources. The remaining seven contributions discuss various ways in which the material presentation in either manuscript or print played a part in the interpretation of a variety of texts, including Basinio of Parma's Hesperis, Niccolò Perotti's Cornu copiae, some poems by Janus Secundus, a commentary on Horace's Ars poetica, Otto Venius' Emblemata Horatiana, Johann Lauremberg's play Pompejus Magnus, and the Alithinologia by John Lynch.